Globally, natural gas mobility is an evolving industry that continues to thrive, expand and consolidate despite market challenges. Natural gas vehicles (NGV) operate in more than 80 countries and natural gas propulsion is taking vessels along inland waterways and across oceans. Regulations and standards are a vital component of this industry. Such is the context in which several documents were tabled at the UNECE Group of Experts on General Safety (GRSG) meeting on 10-13 April 2018 in Geneva. NGV Global was in attendance to ensure the best interests of the worldwide natural gas for transportation industry were kept to the fore. Discussed were proposed changes to UNECE R.110 (CNG/LNG Vehicles) including CNG cylinder inspections, and expansion to applications for on-board vehicle appliances. NGV Global brings considerable expertise to these meetings, confirming its ongoing commitment to ensuring best practice for the industry. The Association, now more than 30 years since inception, participates on no less than 14 ISO committees covering gaseous fuels technology, ships and marine technology, cryogenic vessels, cylinder design, measurement, classification and more. For the majority of these forums, NGV Global is the only participant with a global natural gas overview, particularly for land-based transportation (road, off-road, rail). Harmonisation is vital for all industry stakeholders, but particularly OEMs, component manufacturers and global suppliers. Without this perspective, each country would introduce and enforce its own unique requirements, making the costs of implementation and growth strategies astronomically expensive. One major stakeholder has estimated that annual cost to be in excess of USD 100,00 per annum. In addition, NGV Global represents the industry on three UNECE Working Groups, of which GRSG is one. Our UNECE activity falls under UNECE World Forum for Harmonization of Vehicle Regulations (WP.29) which is a unique worldwide regulatory forum within the institutional framework of the UNECE Inland Transport Committee. The Geneva meeting is the latest in a series of meetings seeking to resolve issues pertaining to CNG cylinder inspections. The same regulation applies to LPG tanks. Other participants in discussions include contracting parties, NGOs, and equipment and vehicle manufacturers. Out of these meetings has come an amendment to R.110, now adopted, that requires new designs for protective covers on CNG cylinders so that they can be opened without the use of tools in order to expose the cylinder for inspection. Tools such as lights, mirrors and endoscopes are allowed in order to view those parts of cylinders that might be obscured due to the manner in which it is mounted either on the exterior or interior of the vehicle. New designs for CNG cylinder protective covers will be required for retrofitters by September 2019 and for vehicle approval (OEM vehicles) by September 2021. There has been some discussion also about a proposal to entirely remove dome covers for Type IV cylinders for inspection purposes. Such a change could impact all composite cylinder manufacturers. The proposal is not without cause but requires further investigation. A proposal was adopted to harmonize R.110 with ISO regarding CNG cylinder testing procedures and was due to a transposition error in the table that otherwise would have affected these procedures. R.110 was proposed for amendment by the addition of terminology covering new requirements for components used in LNG/CNG systems such as a ‘CNG accumulator’ and a ‘CNG compressor’. R.110 terminology with respect to the regulated inclusion of a gas flow adjustor was introduced by OICA, the Association of International Car Manufacturers, for future amendment. Natural gas heaters and refrigeration systems are already permitted under existing provisions. 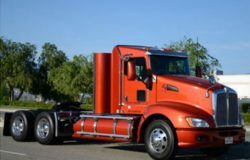 It has been proposed to add a natural gas-fired generator to this list, providing power for the driver in sleeper cabs overnight or to maintain battery charge during high electrical power use with loading or lifting equipment, etc. The change is specifically for Liquefied Natural Gas (LNG)-powered trucks in order to reduce the tank pressure and to prevent or delay venting. The avenues for making regulatory change are restricted by a challenging trio: cost, location and rules. The advantage of an international association such as NGV Global rests in its experience, longevity and wealth of knowledge, commanding respect in international forums. Members of NGV Global and its Affiliated Associations (NGVA Europe, NGVAmerica, ANGVA (Asia-Pacific), KANGV (Korea), NGV Italy, CAGNC (Argentina) and NGV Ukraine are able to participate in the regulations and standards development process, making a real difference where it matters. The International Organization for Standardization (ISO) is an independent, non-governmental organization with a membership of 161 national standards bodies. The United Nations Economic Commission for Europe (UNECE) includes 56 member States in Europe, North America and Asia. However, all interested United Nations member States may participate in the work of UNECE. Over 70 international professional organizations and other non-governmental organizations take part in UNECE activities. NGV Global is The International Association for Natural Gas Vehicles. Information about NGV Global’s involvement in standards and regulations can be found at www.ngvglobal.org. Inquiries welcomed by email to [email protected]. Currently there are more than 25 million vehicles operating around the world. See NGV statistics here.